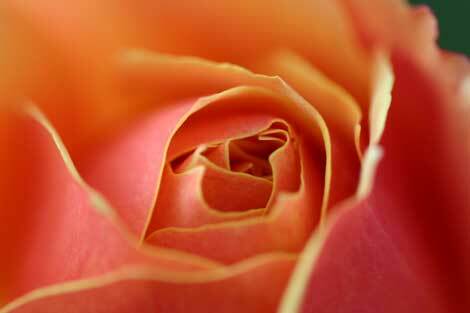 Macro photography is getting close up to your subject, about 1/10 life size. That’s a plenty more technical terms, but I don’t worry about the math. Being an photographer and an artist, my subject and the story I want to convey are the starting point for me. 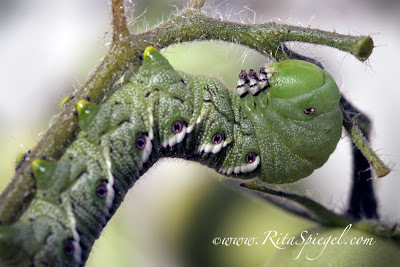 I saw this caterpillar basically eating all my tomatoes, I decided not to get upset, but grab my camera. I then decided on my composition and lighting options. With macro, there are many other “techno” stuff and there are many sites* you can google that will give you all the techno terms, but it is your eye and your imagination that really creates the photograph. The close up on the rose, I was able to focus on the petals and where the rose starts to bloom. With the butterfly, I was using his wings as an arch in the photograph, but I focused on his head/face. 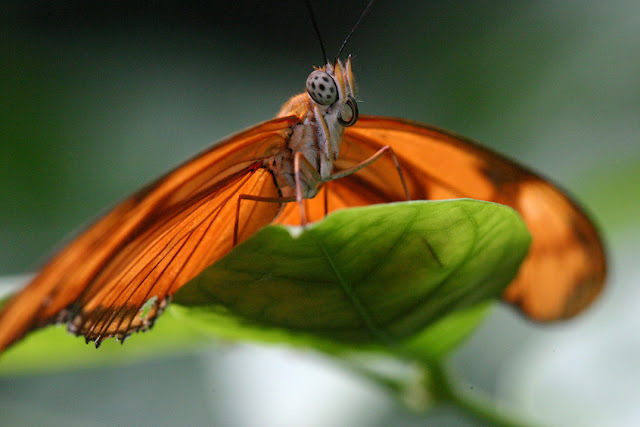 How often you see see the face of a butterfly? Many people shoot with a point and shoot camera. Many have built-in macro settings. These will let you get in close and gives you a good introduction of macro. If you like macro shooting you may (in time) look to upgrade your camera to a Digital SLR and macro lens will give you some creative images. The first thing to decide is your subject. There are many that provide incredible images. I use my macro to shoot bugs, flowers and leaves. Once you’ve decided on your subject, that lighting needs to be considered. Personally, I shoot in natural light, using my Canon Rebel XTi 10.1 MP (2006 - there are newer rebels available) and a Canon EF 100mm f/2.8 macro lens. Using natural lights does have limitations, including eliminating depth of field for large apertures. Many photographers use a flash or two flashes (mounted at opposing sides of the lens). It can become expensive to purchase the many flash attachments that are available. Unless you macro shoot a lot, or have the income to afford the expense, I’d recommend playing with natural light when you’re just beginning. The next thing to consider is the distance your lens is from your subject. With a macro lens, you can (and need to) get up very close. This means, your lens is between one inch and one foot from your subject. For flowers, this is easy, but it is challenging for bugs. For example, caterpillars who move extremely slow, you can set up your tripod easily, but butterflies create more of a challenge. But with practice, you will love the images you can create. Turn off the auto-focus. When your extremely close up to your subject, our camera’s computer may not adjust and it may not focus on your subject. I tend to focus and then move the camera closer to the subject. Any little movement will change the focus. I use a tripod for macro shooting. The Canon 100 Macro lens can be heavy to handhold and maintain focus. When people think of succulents, the image on the left isn't what comes to mind. 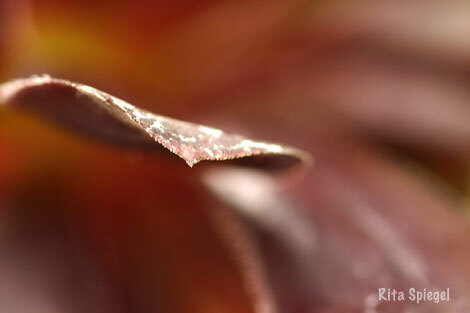 But I just focused on the tip of one leaf and kept everything else out of focus. I usually focus my lens and then focus the image by moving the camera. This keeps framing constant. Small variations in your position become huge variations in image size, so fixing the focus and moving the camera keeps this stable. Other people prefer to hold their cameras. It really depends on your preference and that comes with experience in shooting. Try both ways, tripod vs. hand holding. The only way to decide is experimenting with your options. When I’m writing about Macro shooting or other types of photography, I’m sharing with you how I photograph my subjects and/or about what works for me. Photography, like any artistic process, is personal and subjective. The important thing to remember is that you like your photograph and enjoy shooting your end result. Hopefully, this will give you a basic overview about Macro and how you can create incredible images and art. My main recommendation is to play and experiment. Keep shooting and you’ll keep learning. Have fun taking photographs and share your images with family and friends. *I do recommend Ken Rockwell’s website. He’ll give you a wealth of information and ideas.